04/19/2012 (PH) Stand Up World Series Philippines – cancelled! CamSUR was supposed to be a Prime Event of the Stand Up World Series with 20.000 US$ prize money. This has been moved to April 2013. Riders from different continents including European Racers Eric Terrien, Belar Diaz, Fred Bonnef and Fabrizio Gasbarro had already booked their flights but were informed yesterday (that is one week before the scheduled start) that the event is cancelled. Initially it was said it would be moved to June, now it sounds like it is cancelled alltogether (official confirmation pending). There had been many schedule changes before, but such a short notice cancellation is even more disappointing and will certainly not help get the Stand Up World Tour off the ground. This news is based on the info we received from the European riders, we are still awaiting official confirmation from the organizers, but are not surprised that we haven’t received that yet, for the St. Maxime race, it was still announced as World Series in the Watermen League Press Release on March 26th, we heard from Yannick Pinnault, the race director, that it is not World Series anymore on the 27th, but the official press release confirming this did not reach us until April 9th. “The CamSur World Paddle Challenge will make history next week as the first major Stand Up Paddle event in Asia, opening the market to some of the very best and most high performance Stand Up Paddling in their own backyard. 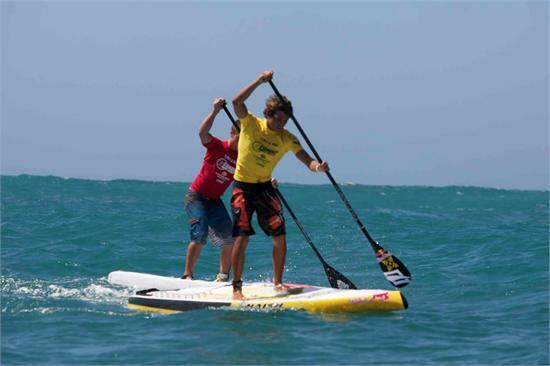 Athletes from Hawaii, Australia, the US, Brazil, Italy, France, Spain, New Zealand and from Asia itself will be descending upon CamSur and neighboring San Jose for Stop 2 and the first prime event of the 2012 season for the Stand Up World Series. An international field of elite athletes will be making the trip to the Philippines next week to battle it out for the $20,000 prize-purse and vital ranking points towards their overall standings on the 2012 Stand Up World Series. With it all to play for in 2012, these athletes will be looking to consolidate on their position in the Series leading into the busy summer racing season. Headliners include Racing phenom Connor Baxter (Starboard) from Maui, World Champion Stand Up Paddlesurfer Kai Lenny (Naish), young Aussie stand out Jake Jenson (Naish), leading European star, Eric Terrien, but also other leading lights of the sport such as Zane Schweitzer (Starboard) from Maui, Bart de Swart (Starboad) from Holland and Belar Diaz (Fanatic) from Spain. All Stand Up World Series dates are here.